I just got an agent who has actually made sales and isn't a scam artist or anything! Woo hoo! The problem is, I want to email her ALL THE TIME! And not just about my book (which is already out with a bunch of editor dudes). I want to tell her about my old boyfriends. I want to invite her to go drinking. (I don't drink and I live 2000 miles away from NYC.) I want to send her chocolates in the mail with a note that says, "Be my BFF!!" For the love of all that is holy. Can you PLEASE snark some sense into me? Thanks so much, I think you freaking rock! Your agent is friendly, but she is not your friend. She is a business associate, a colleague. She is your only agent, but you are not her only client. You want her to sell your book, not spend time canoodling with you on email. The two ARE mutually exclusive because no matter how much time you spend writing science fiction, this world still has only 24 hours and Miss Snark must drink gin for several of them, and woo Mr. Clooney for several more. I understand the writer's excitement, having also acquired representation recently. Having someone who seems as excited about your book as you are seems like you have a ready-made friend. But your agent isn't your friend. Do try to resist. Just remember that time spent answering your emails is time not spent selling your book. Can't they at least be pen pals? I think this is just the cutest post written in the cutest voice. 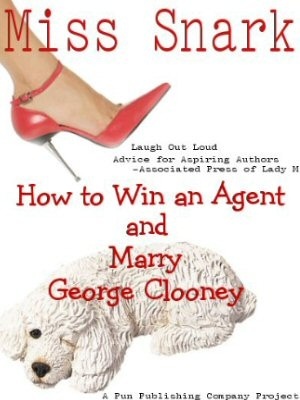 Not a good idea to land on your agent's doorstep with an overnight bag and two tickets to the Ice Capades, but you'll be able to use this down the road when you write your how-to-get-an-agent-and-keep-her book.